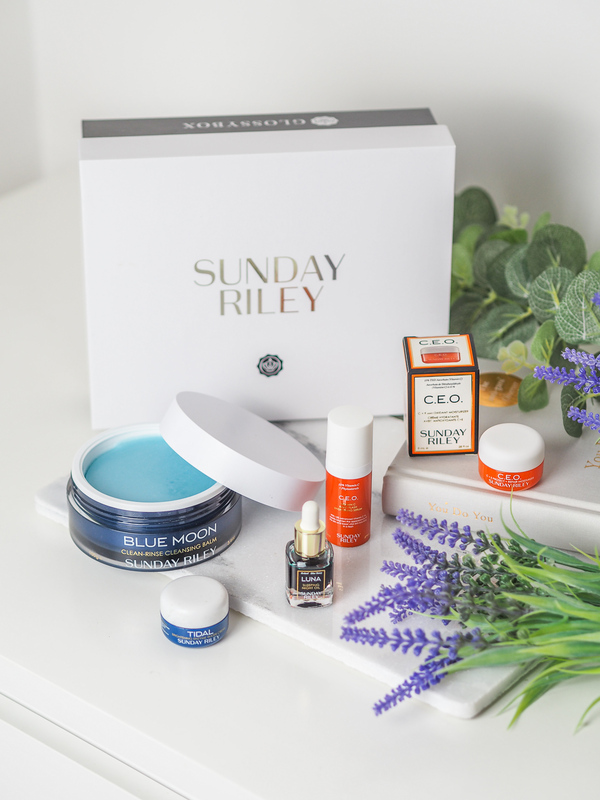 Sunday Riley is a US skincare range taking the world by storm. Supposedly found backstage at most fashion shoes and dubbed the ‘internet’s favourite skincare brand’, rumour has it there are some celeb fans too. The range has gained a reputation for using high-tech formulas and the purest A-grade ingredients resulting in fast, visible and long lasting results. Sign me up!!! 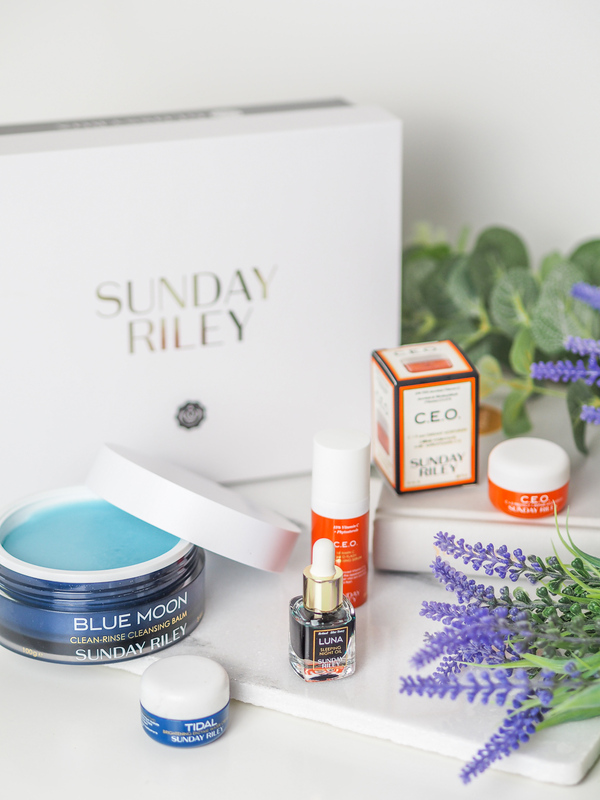 We all know I love a cleansing balm, and surprisingly right now I don’t have one in my skincare routine, so I’m so pleased that the Sunday Riley’s full-sized product was just that. The Blue Moon Tranquility Cleansing Balm is a luxurious, balm-to-milk cleanser. It uses gentle, clean-rinsing, sugar-based cleansers to deep clean as it moisturises with cocoa butter and mimosa flower wax. It soothes with deep-blue essential oils of blue tansy and German chamomile. Vanilla and sweet orange essential oils help to relax the mind for a spa-like experience. It removes make-up and gently purifies the skin when massaged into the skin morning and night alongside the use of a cloth. I can just tell I will LOVE this product. 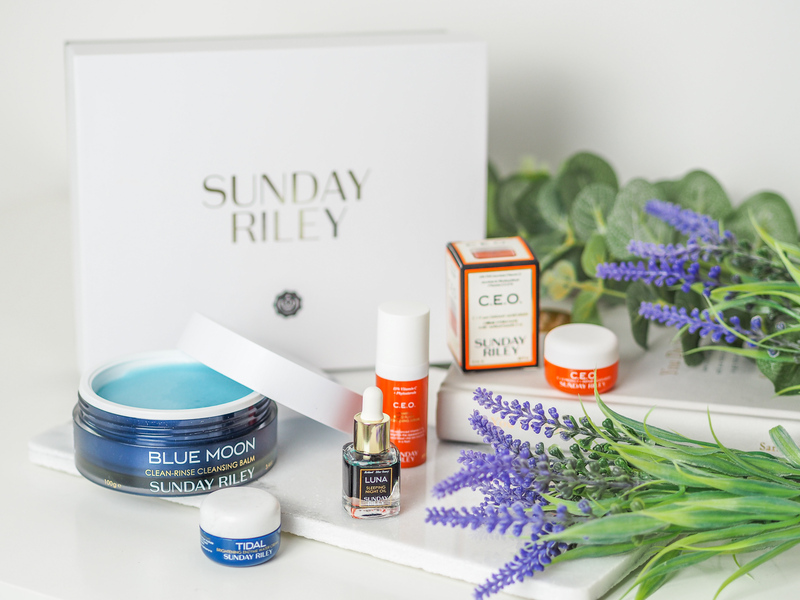 Even better, full size this would have set you back £46 – this Glossybox is already worth the money! Next in the box is the deluxe mini Rapid Flash Brightening Serum, worth £20 for the mini, and #70 for the 30ml full-size product. This aims to get you glowing with highly-potent, fast absorbing serum infused with 15% vitamin C. The hydrating antioxidant formula fights the look of dullness, dark spots and instantly brightens your skin for intense radiance and luminosity. I’ve never been one to adventure past moisturisers into serums, but I’m excited to give this a go, especially now we’re getting into the colder months, my skin is going to be dying for some Vitamin C! The most extravagant name for a moisturiser or what?! The next product is a hydrating which infuses skin with high-potency, advanced vitamin C and smells like ‘pure sunshine’ (anyone know what sunshine smells like?! )… This miracle moisturiser provides antioxidant support and fights the effects of micropollution and induced ageing. The mini version you receive in this box is worth £12, while the 50ml full-size product is £60. Water cream is definitely something that catches my eye – it reminds me of my favourite Moisture Surge, but we’ll see how this compares. This is a super hydrating advanced brightening and refined treatment. It should be applied twice a day to visibly brighten hyperpigmentation over time, or pat the formula on top of makeup to seal in hydration and radiance. Again, this mini is worth £12 and the full 50ml size product worth £60. Finally is a best-selling product from Sunday Riley, reportedly loved by supermodels and celebrities (totally worth giving it a go if it makes me look anything like a supermodel!!!). A derivative of Vitamin A, retinol boosts your skin’s plumpness, while improving the appearance of wrinkles, redness and pores. The blue oil turns clear as you massage in the skin and is advised to be used at night for the ultimate beauty sleep! This mini would set you back £15, and a full-size £85. It’s clear from the descriptions and prices that this definitely isn’t a budget-friendly skincare brand, which is why I’m so grateful to get the chance to give a few products a try to see if they’re really worth their hefty price-tag. Have you ever given Sunday Riley a try? If this limited edition box takes your fancy subscribe now and use LUCY15 for 15% off your order! *This post contains gifted items and affiliate links. "Trying something new with cropped wide leg jeans"
"What’s so wrong with blogging for money?"